Adapter cards for computers come in many different shapes and sizes and have many different functions. 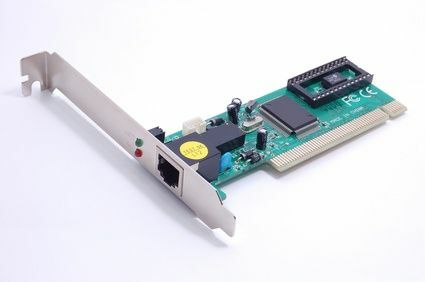 Adapter cards, also called expansion boards, according to webopedia.com, are pieces of hardware that allow a computer to use a specific device such as a video card or network adapter card. "Adapter card" is a broad term that encompasses many peripherals and devices. A wireless network adapter card is used to give wireless Internet capabilities to a computer that previously lacked such capability. While there are USB network adapters as well, their range and throughput aren't as high as network cards that plug into PCI and PCI Express slots on your computer's motherboard. According to RamElectronics.net, most computers come equipped with wireless network cards.You'll have to open your computer tower and physically plug the card into your motherboard in order to install a PCI adapter. Your computer's graphics card plays a large part in the picture quality of video, computer games and other images. These devices work in conjunction with your monitor, processor and other computer components to deliver both text and graphics. According to Webopedia.com, graphics cards contain their own memory so that they don't have to use the computer's RAM to store displayed images. It's much easier to upgrade and customize your graphics card in a desktop PC than it is in a laptop with limited space and condensed hardware. The graphics accelerator, not to be confused with the graphics card, is a separate video adapter used to boost the performance of the user's computer by handling graphical information so that your computer's CPU is free to handle the rest of the computer. Today's graphic intensive software and games require a lot of graphical computations that bog down low-end systems with commands that could otherwise be handled by a graphics accelerator. A sound card is an expansion board that allows your computer to edit and play sound. According to Webopedia.com, sound cards are commonplace in most computers, as they have become a necessary add-on for today's average computer user. Sound cards allow computer users to plug headphones, speakers and microphones into input and output jacks located on the external portion of the sound board. Most sound cards support the MIDI standard and are able to process commands designed for Sound Blaster sound cards, the standard for sound on PCs. Accelerator board is a term that is sometimes used as a nickname for Graphics Accelerators, but an accelerator board is also an expansion that allows a computer to run faster through the addition of a faster CPU or FPU. The board attaches to a socket on the motherboard, according to Webopedia.com. They also point out that users wanting a faster CPU also have the option of removing their current CPU and replacing it with a faster one. Make sure the device connected to the card is working. For example, if an external CD drive is using an eSATA port on a storage controller card, move the drive to another eSATA port. If the drive works on that port, return it to the controller card. Perhaps a bad connection was the problem. Update the driver drivers for the card. Download the latest drivers from the manufacturer Web site. Also, use the process described to make sure all Windows updates are current. Try uninstalling the card. Use Device Manager to uninstall the card drivers. An exception to this might be a storage controller card. Its drivers might need to be uninstalled by executing the Setup.exe program on the driver CD. For example, when you run this program for one card, the window appears. Select Remove and click Next to uninstall the drivers. Then reboot the system and install the drivers again. Watch for error messages during the installation. Try reseating the card or moving it to a different slot. Search for diagnostic software on the driver CD or on the manufacturer Web site. Use technical resources available on the manufacturer Web site for things to do and try. Search the Internet for error messages and problems and solutions with the card. Try replacing the card with one you know is good.